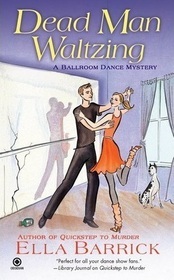 The professional ballroom dance community misses several steps when they learn that Corinne Blakely has been poisoned. She was publishing a tell-all memoir that included several secrets of her former dance partners. Was she killed to stop publication of the book that told several people moves both on and off the dance floor? Stacy gets involved when Maurice, one of her dance instructors and one of several of Corrine’s ex-husbands, becomes the prime suspect. Hopefully Stacy knows all the right steps to clear Maurice’s name and waltz away before the real killer can punch her dance card. With the craze of Dancing With The Stars which Green Bay Packer Donald Driver won last season this a entertaining series. It looks more at the professional dancers but when we read Viennese Waltz and Paso Doble we can see the dances clearly in our minds. We get to follow the clues to the mystery with Stacy plus we get a behind the scenes look of running a ballroom dance studio and the dedication it takes to compete in ballroom dances competitions. In this installment the pros were campaigning to make ballroom dancing an Olympic sport. Another light, fun and entertaining cozy from Ella Barrick. A new trip across the dance floor will be out in September. Maybe Stacy will be tripping the light fantastic with someone special. I love to ballroom dance! This looks like a great book. I love to watch all of those dancing shows! Sounds like a good book.